Saina Nehwal defeated Japanese shuttler Akane Yamaguchi 21-15, 21-17 in straight games. Star Indian shuttler Saina Nehwal on Thursday stormed into the quarterfinals of the Denmark Open by defeating second seed Akane Yamaguchi of Japan 21-15, 21-17 in the second round of the tournament. In a match that lasted 36 minutes, world no 10 Saina looked positive and played aggressively from the word go against her Japanese counterpart. Saina's swift court movements and powerful smashes helped her beat Yamaguchi for the second time in their eighth meeting. Saina will now take on former world champion Nozomi Okuahara in the quarters. In the first round match on Tuesday, Saina managed to register a hard-fought 20-22, 21-17, 24-22 win against Hong Kong's Ngan Yi Cheung in a match that lasted 81 minutes. World no. 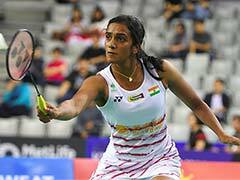 3 PV Sindhu, on the other hand, crashed out of the tournament, after suffering a first round exit against unseeded Beiwen Zhang of the United States. Sindhu lost 17-21, 21-16, 18-21 in a match that lasted 56 minutes. In men's singles, India's Sameer Verma beat Jonatan Christie of Indonesia 23-21, 6-21, 22-20 to enter the quarterfinals. In women's doubles, the pair of Ashwini Ponnappa and N Sikki Reddy beat Lee So Hee and Shin Seung Chan 18-21, 22-20, 21-18 to enter the quarters. The Indians won the match in one hour and one minute. Earlier this month Sindhu, Srikanth and Saina bagged deals worth Rs. 80 lakhs in the Premier Badminton League (PBL) 2018 auction. Srikanth was bought by Bengaluru Blasters while Saina Nehwal will be seen playing for the North Eastern Warriors. PV Sindhu will represent the defending champions Hyderabad Hunters.